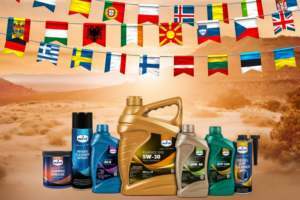 Eurol Powersteering fluid C | Eurol B.V.
Power steering Fluid type C is a fully synthetic hydraulic fluid, especially developed for hydraulic systems like levelling systems and power steering systems in tractors, passenger cars and commercial vehicles. Due to the high viscosity index and a very low pour point, the viscosity will hardly change under varying temperatures. Because of the high boiling point and the water resistance, the product can be applied for a long lasting and safe use when this type of fluid is prescribed.